I am sure he wasn't the first to cry, or the last. The tears could have been from shear relief to have the climb over and done with, but more likely the tears were proof of the emotional response to the accomplishment of conquering the Tourmalet. 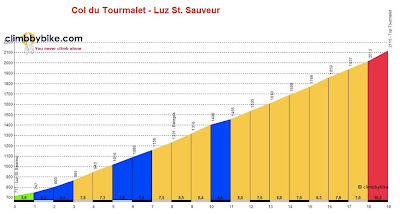 The Col du Tourmalet is a massive climb. A climb of dreams and determination, of history and triumph. Most cyclists would love to pit themselves against the Tourmalet, even if it meant shedding a tear. I thought I was a bit crazy for attempting it on my third day in France. I awoke to another glorious blue-skied day in the Haute-Pyrenees. I decided to give the Col du Tourmalet a try today because the weather was perfect and the climb was directly up valley from where I am staying. I am also rethinking my intention of being at the top of the Tourmalet for Stage 17 of the Tour de France. Reportedly 1.5 million are expected to show up for the mountain top finish. The usual number of people on the Tourmalet for a day of the TDF is typically closer to 600,000. The climb is only 19km long. Logistically the Tour de France stage to the top of the Tourmalet could be a nightmare. This year's Etape du Tour takes place the Sunday before on July 18, 2010. Two days later on Tuesday, July 20th, Stage 16 crosses the Tourmalet from the east from Bagneres-du-Luchon to Pau. Two days after that, on July 22nd, Stage 17 crosses back from Pau to the top of the Tourmalet from the west side. The organizers of the TDF have planned three huge events on the Tourmalet within 6 days. It seems that there is not enough room for RVs, and cars, and campers, and walkers, and cyclists to coexist on this mountain. Still it will happen, but it will be "mental," as Paddy, the owner of the cycling lodge where I am staying in Saint Savin mentioned this morning. The local rumor is that the route will be closed to all vehicle traffic as early as Friday night, July 16th until after the stage on the 22nd of July. Because of the uncertainty, I decided to go for the Tourmalet today, just in case it doesn't work out on the day of the Tour de France. Anyway, long story short - it was a hard climb, really hard. As one of the Danes at the cycling lodge warned me over breakfast this morning, "right near the top, you take a left turn into hell". Upon return, I reported back to them that I had found hell a little earlier down the road, "closer to the town of Bareges, I would say". This evening at the cycling lodge, Paddy and Olive and Hanna (their niece visiting from Ireland) treated us to a wonderful BBQ dinner outside in the garden. We enjoyed BBQ Toulouse sausage, a spicy local sausage, hamburgers (meat muffins as Casper the Dane called them), lettuce salad, egg salad, cous cous (bulgur), enormous chicken, and lots of red wine. We were visited in the garden by the local 6-year old neighbor boy, Jean Baptiste, who sprang upon the guests showering us all with kisses on the checks and then sat happily eating the ice cream and apple tart offered him. It wasn't long before his older brother showed up and called him home for dinner. We all had a good laugh realizing we had just stuffed him full of dessert before he had eaten is own real dinner. Jean Baptiste was truly delightful and I had fun trying to follow his 6-year old french, just about my level. *visit Paddy's blog to see some great photos of the guys from Ireland and Denmark hanging out with Lance on the the top of the Tourmalet yesterday. In the photo are Ciaren, Lance, don't know who, and Soren. This is the garden, and my room at the end with the balcony view of the Hautacam. Some pictures from my ride up the Tourmalet today. At the town of Luz Saint Sauveur, hang a right for Luz Ardiden, or a left for the Tourmalet. The ride up the Tourmalet from the west side is as much a mental game, as it is a physical one. I appreciated the encouragement I received from other cyclists who cheered me on as they descended and I was still in hell, continuing my long climb to the top. I heard Allez allez, i-ya, courage, ce bon, and plenty of smiles and nods. At the top, I was thinking about asking these guys their opinion on motorized doping. Why were there no signs at the top of the Col du Tourmalet telling me the slope difficulty? I saw two, then they stopped? [Answered by Paddy Sweeney] The customary white signs at the top of most climbs in the Pyrenees marking the distance and slope, are removed on the Tourmalet every winter so the skiers do not ski into them. They are replaced again in July. Another interesting fact offered by Paddy: the famous silver cyclist at the top of the Tourmalet is removed every winter and stored down in Bagneres-de-Bigorre at the Laurent Fignon Cycling Center. He was just brought back up within the past week. This was my third time to climb the Tourmalet, it wouldn't have been the same if this statue had not been there. The restaurant at the top of the Col du Tourmalet signals you have arrived! I rested for a long time at this cafe because the weather was so nice and the people coming through were very interesting to watch. Then I made the long descent down valley back to Luz Saint Sauvuer (that is Luz Ardiden in the background) and returned to Saint Savin (the town up on the hillside) near Argeles-Gazost. It is a perfect location.